Ruby (Perfume Oil) is a new perfume by Bruno Acampora for women and was released in 2018. The scent is gourmand-sweet. Projection and longevity are above-average. It is still in production. This is a variant of the perfume Ruby (Extrait de Parfum) by Bruno Acampora, which differs in concentration. I was amazed when there was a bar of pink chocolate on my desk. Never averse to confectionery, the development of a new type of chocolate had in fact completely passed me by. And apart from the fact that the chocolate bar was incredibly rich in sugar, I would classify my first encounter as delicious. The Ruby chocolate was pink, soft and tasted like berries, in my opinion a mixture of raspberries and blueberries. Whether this would ever knock my favourite chocolate off the podium, however, I strongly doubt. 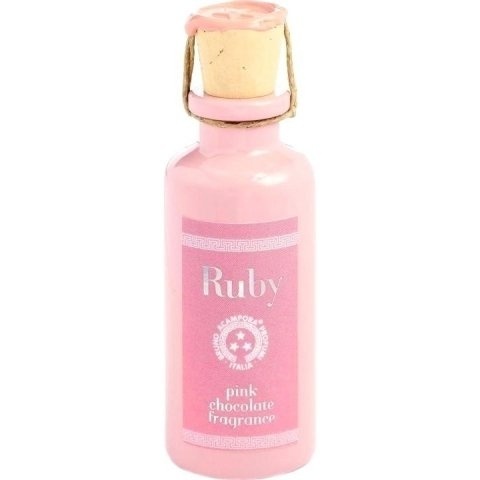 Anyway, from that day on, the fragrance "Ruby" with its chocolate notes also made sense to me and got on my internal watchlist. A very helpful Parfuma gave besides a few estimates to the smell and beat thereby my Gemerke finally in stone. On the back of the hand, the resemblance of "Ruby" to ruby chocolate is striking. I would think that the olfactory impression was converted 1 to 1. Chocolaty, slightly fruity and sour with a hint of berries and a little bit of fruit sweetener. Amazing. The overall impression of wearing, however, differs slightly from that of the test site. I think I took a full bath in a tart chocolate with a high cocoa content. The Sillage is strong for hours, because according to Mr. A. the three drops fill the whole room. The scent is clearly dark and not sweet, the berry aroma only very reservedly recognizable. It lasts for hours. I can't see the stages of development, except the "Ruby" in the evening smells more like a bitter vanilla with a delicate floral scent. Although the fragrance lacks some change and a dark chocolate note can be a bit exhausting, "Ruby" doesn't bore me. I don't see it as a perfume for very young women, because I think it's too harsh for that. That should keep any Barbie princess at a distance. In my opinion, the perfume delivers what it promises and has been very well implemented. If I would buy it again beyond my miniature, I don't think so. I would like to give a hot test recommendation to anyone who can't imagine anything more beautiful than authentically smelling of dark chocolate. Write the first Review for Ruby (Perfume Oil)!